Posted on 30/11/2013 by the curtain raiser •	This entry was posted in Australia, Life and Family, NaBloPoMo and tagged Australia, baseball, bonding, Boston, Boston Red Sox, Chicago White Sox, Fenway Park, life, NaBloPoMo, sport, World Series. Bookmark the permalink. 😀 you always bring a smile and you are welcome. I am not sports minded at all, although we used to play baseball when I was a kid. Nice to hear the win made for a good excuse to connect with a long absent friend. Thanks for your support as always, Tess. And yes, the reconnection was a real highlight. 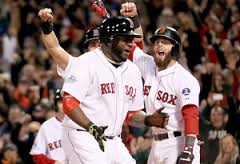 The Red Sox seem to be a team which really evokes emotion. I suppose the Red Sox fans have a lot of catching up to do after the breaking of the Babe Ruth Curse. I would have liked to seen the images of some of those tombstones all decked out in the blue and red, would be quite moving. I’ve been a Red Sox fan since 1966, and for me personally, the 2013 season has become one of my two all time favorite Red Sox experiences, second only to 2004, when the Yankees beat the Red Sox in the ALCS three games straight, and then the Sox sent the Yankees away to swing golf clubs instead of baseball bats, by beating the Bronx Bombers in four games straight. The 2013 Red Sox remind me of a movie about a musical group called “The Replacements”. They didn’t look like very much, and before the season started few people expected much of anything good to come from them. Until they started to play… and then we all got to see just how good our Red Sox “Replacements” could really play, when they played better than everyone else. Yeah, I definitely fell in love with Yaz, Rico, “Gentleman Jim” Lonborg, George Scott, Joe Foy, Mike Andrews, and Tony C, although his was a very sad story in August of ’67 after he got hit by a pitch that all but obliterated his right eye, and ended his season. At least he wasn’t killed, because he could have been, and when he was knocked unconscious by the pitch, and then he never moved, even while being carried off the field on a stretcher, many fans there at Fenway feared that Conigliaro was dead. But Jude, I am genuinely impressed with your knowledge of the “Cardiac Kids” on the ’67 Impossible Dream Team, and although I already knew that you are without a doubt a true Red Sox fan, I’m all the more impressed that you are also so well versed in Red Sox history from over 46 years ago. I’m glad that my first full season of being a Red Sox fan was the year before 1967, when the Sox were never in contention and finished in ninth place. Fenway Park was lucky to have ten thousand people show up for a game in 1966, but of course that all changed in very dramatic fashion a year later, and although I was only 10 years old back then, I could still really appreciate the difference between 1966 and 1967. Uhm yeah… Red Sox fans were taken to the brink only to be deeply disappointed many times, but 2004 took away that collective curse we all lived through, with what seemed like a true baseball miracle, since no MLB team had ever lost the first three games of a best of seven series and then come back to win the series by winning four in a row. Thanks again for blogging about the Red Sox, Jude. I think that you deserve at least partial credit for an assist, by motivating me to do something last night that is Red Sox related, that I’m now very glad I made the effort to do. I wasn’t going to blog on WP about my off season Red Sox project that I just completed an hour ago, because of my 171 WP followers, I think that you are the only Red Sox fan in my following. It’s great to see you back on here Chris and thanks for the comment. Indeed, the 2004 series was when the Red Sox became our team for life. I wonder how next year will go now that Elsbury has been traded to the evil empire.